The Columbia River Gorge has something for everyone. A popular destination for outdoor enthusiasts, the Columbia River Gorge is one of North America’s most scenic and impressive canyons. The canyon stretches in excess of 80 miles as it passes directly through the Cascade Range, forming a nearly sea-level passage through outcroppings that loom as much as 4,000 feet above the river. 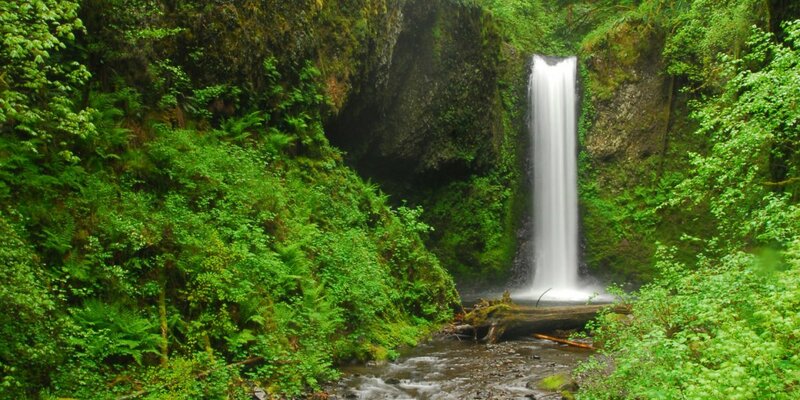 Whether you're looking for a family-friendly hike, a good workout, wildflowers, or a 600-foot waterfall, you'll find it all in the Columbia River Gorge. To highlight the different trails, we figured it would be best to highlight trails that stand out as one of the best in a specific category. Horsetail + Ponytail Falls is a great hike for the whole family to enjoy. This 4-mile trail has very little elevation gain, four waterfalls, old-growth forest, and plenty of wildflowers to keep the kiddos entertained. Multnomah Falls is Oregon's most visited natural attraction, and it receives over 2.5 million visitors per year. Even though it's crowded, it's certainly worth a stop. It's only a quarter-mile to the popular Benson Bridge and a total of 1.1 miles to the top of the falls. Starting at Wahkeena Falls and ending at Multnomah Falls, this short 5-mile hike passes 10 impressive falls and catches some beautiful views of the Columbia River below. Weisendanger Falls on Multnomah Creek. Photo by Tyson Gillard. The trailhead and trail to Spirit Falls are not well marked, but if you download our free map you shouldn't have any trouble. Even in this incredible environment, the Oneonta Gorge stands out as a unique and exceptional area. Scramble over a huge log jam, wade through the stream that flows through the narrow basalt canyon, and find your way to the hidden waterfall. It's hard to beat Angel's Rest, and we wont try. We will, however, offer a second, and often less traveled alternative, the Cape Horn Hiking Trail on the Washington side of the Gorge. Climbing to the tip Indian Point requires some technical skills, but the views are just as rewarding from the top of the ridge connected to the point. This hike is close to Portland and much less crowded than its neighboring hikes. View from Indian Point. Photo by Halvor Tweto. Chinidere Mountain + Wahtum Lake offers amazing views of Mount Hood, Mount St. Helens, and Mount Adams. Though it's a 2-hour drive from Portland, this short trail packs a punch with less elevation gain than other Columbia River Gorge hikes. 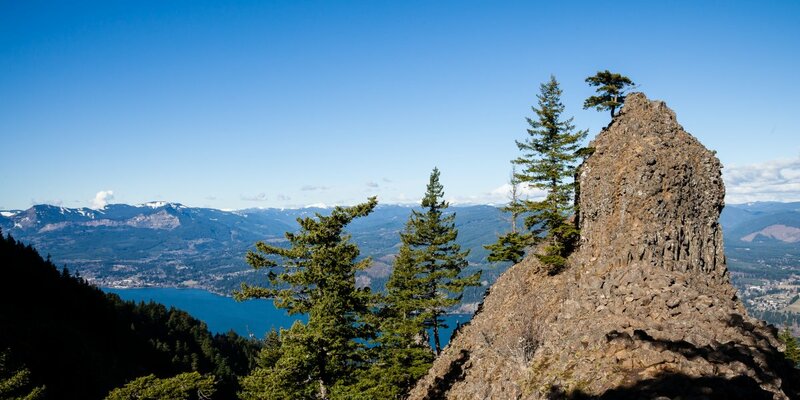 Sherrard Point on Larch Mountain is a close second, and it is easily accessible in the summer. It makes a great 9-mile snowshoe in the winter. The Vista House along the Old Columbia Gorge Highway is a great stop to see the Gorge, and the drive will take you by some beautiful waterfalls. Though many of the hikes in the Gorge offer a great workout, perhaps none are better than Mount Defiance and its 5,000 feet of net elevation gain. Again, like many of the other hikes in the Gorge, the views will make each foot of elevation worth it. Table Mountain is a good alternative with 3,650 feet of net elevation gain. While most of the hikes in the Gorge include some elevation, the Klickitat Trail, Harms Road Trailhead is as flat as they come and is ideal for hiking or biking along the river. Dog Mountain could be in a number of categories. It has amazing views and the hike is a great workout, but it really shines with a spectacular display of wildflowers in the spring. A good runner-up is the Mosier Plateau Trail. Beacon Rock is one of the easiest and most accessible hikes in the Columbia River Gorge. After you watch the sunset over Portland, a headlamp will help you ease your way back down the paved trail. 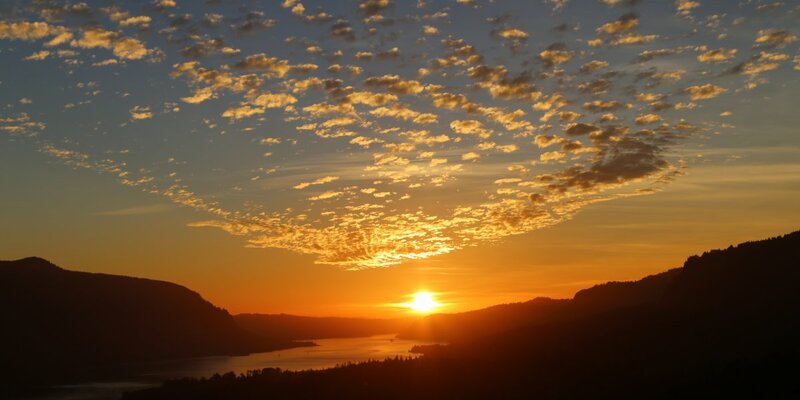 Sunset view from Beacon Rock. Photo by Shane Kucera. By this point you've probably been wondering why Eagle Creek hasn't made the list. Well here you go, best for a hot summer day! The trees offer shade from the summer sun and there are some great swimming holes along the trail. If you're only interested in seeing the Gorge's waterfalls, make your way around this waterfall loop from Portland out Interstate 84, cross the bridge in Hood River, and drive back via HWY 14. Browse the featured adventures below for more amazing hikes in the Columbia River Gorge.